While the name “mini-lobster” evokes images of tiny crustaceans, or some smaller, lobster cousin, Mini-Lobster Season actually has nothing to do with baby lobsters. The only thing “mini” about Mini-Lobster Season is that, legally, this lobster season can only be held for two days. That’s because the official Florida lobster season, which runs for 8 months, doesn’t start until August 6th. Think of Mini-Lobster Season as a pre-party, held every year on the last consecutive Wednesday and Thursday in July. Another difference is that while lobster season attracts many commercial fishermen, Mini-Lobster Season is more of a recreational sport season. In fact, thousands converge on Key West during the last week in July for this very reason. Although Mini-Lobster Season is intended as recreation, there are a few rules that must be followed. -You may need to purchase a license (don’t worry, they’re cheap). Check the Florida Fish and Wildlife Conservation Commission requirements. 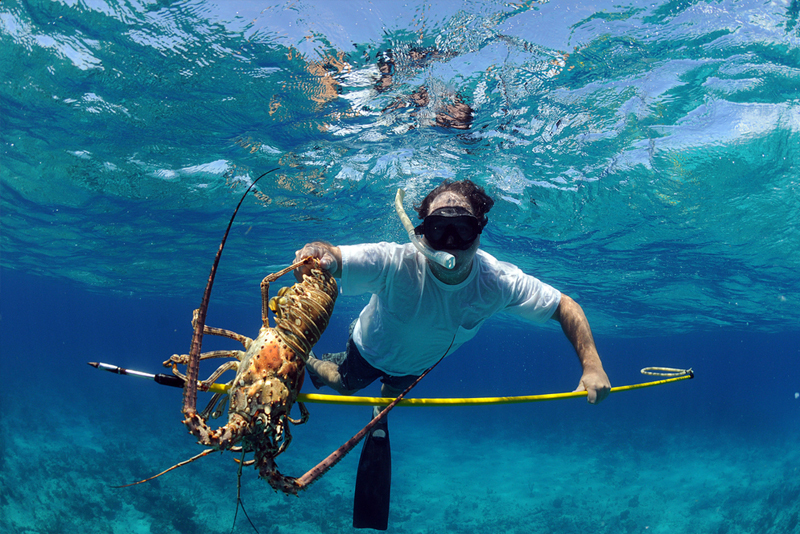 - In some areas, such as the Dry Tortugas, lobster harvesting is prohibited. Check for a complete list. - It is illegal to possess and/or harvest ANY egg-bearing female lobster (egg-bearing lobsters are identified by the bright-orange eggs on their undersides). - During Mini-Lobster Season, it is illegal to dive at night. However, lobsters may be harvested with bully-nets above water. - Due to the lionfish invasion, the State of Florida is offering divers an extra spiny lobster with the capture of 10 lionfish. Don’t think you can catch a lobster? Think again. It’s pretty simple. You only need a snorkel, a poker and a net. Scuba gear is optional, but not necessary. Look for the lobster’s spikes poking out from under a rock or underwater crevice. Have your net ready and then give it a poke to make the lobster come out of its hiding spot. Still not sure you want to provoke a lobster? Unlike other species of lobsters, the Florida spiky lobster doesn’t have claws. You won’t have to worry about getting pinched. That said, you’ve still got a few days to book your Mini-Lobster trip. We know just the spot. The above rules apply only to the Caribbean spiny lobster. The State of Florida does not regulate the harvest of the other lobster species. Mini-Lobster Season 2016 is Wednesday, July 27 and Thursday, July 28.